While in Miami for Art Basel 2017 I was invited to attend a wellness pop up by WeWork called Rise By We. Throughout the week Rise by We offered health & fitness classes, cold pressed juice, hard kombucha, massages and even mini manicures with nail art (still bummed I didn't have time to get this done). Needless to say this quick hour and a half was the perfect way to start my day and take a moment for my personal health & wellness. 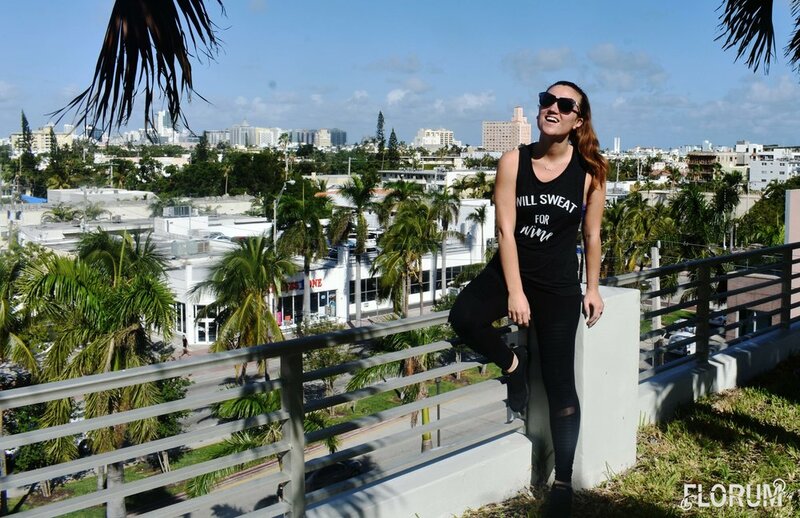 Starting off my Wednesday of Art Week Miami wearing a 'Will Sweat for Wine' shirt from The Wild and Free Project, yoga pants from Alo Yoga, and my favorite sustainable sneakers made from recycled plastic bottles by Spanish green brand EcoAlf. The delicious Himalayan Monk cold pressed green juice from Jugo Fresh was the perfect pre meditation thirst quencher. It wasn't bitter at all and tasted delicious, I think the dash of salt really gave it a unique taste where the ingredients really stood out to my taste buds (I literally could have had like 5 of these, but limited myself to just 1). If your in Miami you can find this cold pressed juice (as well as their other flavors, at any Whole Foods as well as an actual Jugo Fresh storefront in South Beach.& Wynwood. Pictured above is Francine Madera the meditation teacher for the class I attended on Wednesday of Art Week Miami 2017. I absolutely loved that she was wearing an ethical fair trade top from sustainable fashion brand The Onikas. For an hour I was able to clear my mind and give myself a little reboot before stepping back into the craziness of Basel. For those who haven't been and aren't sure what I mean by 'craziness,' Art Basel is a week of Art Fairs (19 big fairs and many small ones), PR events (from liquor to fashion brands) while trying to run around South Beach and Downtown trying to fit everything into the day (which I can tell you is pretty much impossible to do everything that you want to do, so stress levels are at a high). Francine Madera from Innergy Meditation leading a meditation class on the rooftop of Wework in South Beach Miami off of Lenox Ave. If you happen to be in Miami, be sure to stop by Innergy Meditation in South Miami Beach to experience a class that Francine leads, you wont regret it and your mind will be eternally thankful for the reboot! After the meditation session, I treated myself to my daily dose of probiotics via Kombrewcha. Kombrewcha is known as the first hard kombucha, and the Royal Ginger & OG (not pictured) were my favorites! My friend Iva Grabic getting her 15 min massage from the lovely ladies of Exhale Spa Miami. It was honestly such a treat to get a shoulder, neck & back massage mid week at Art Week Miami. After this experience all I can say is that I am super excited for the next time I am in New York (which will be New York Fashion Week in February) to go check out the actual Rise by Wework and not just a pop up. Special thanks to to Rise by WeWork for inviting me to this lovely popup and helping me find balance & peace of mind in the middle of a very hectic and busy Miami Art Basel week. I hope you'll come back next year and host another pop up, as I know that I would 100% be back.